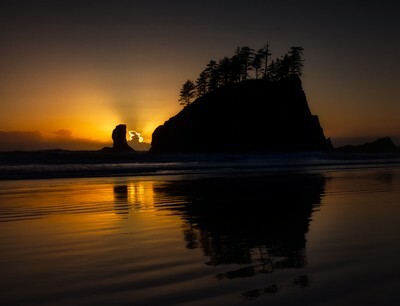 This photo was shot in Olympic National Park, at Second Beach to be specific. I had been shooting around the park and the Hoh rainforest areas throughout the day, so it was natural to finish a great day outdoors by heading to the beach and the famous sea stacks with a sunset. Olympic National Park is in Washington State on the west coast of the US, and this was taken at the end of the day as the sun was setting over what had been a really fun day of shooting. I had not looked at the tide tables before heading down, so to time it right as the water was receding for low tide was a great bonus! I noticed how the sun and landscape reflected off the thin bit of water that remained on the sand, so I timed it to shoot in between waves to capture that drama. I got a lot of wonderful photos at Olympic, but this would have to rank as one of my best from the trip. Shooting directly into the sun like this can be tricky. One tip is to remove all the glass filters in front of the lens, which will help to minimize the potential for lens flare. Sometimes it can be tough for a photographer to willingly shoot with a “naked”, unprotected lens, but for the best results it is worth it in these cases. I envisioned the sea stack becoming a silhouette so the metering was done for the sky. Taken in Aperture priority mode, the settings were 1/1600th sec, F14 and ISO 400. I shot this with the Olympus OM-D EM-1 body paired with the Olympus M.ZUIKO ED 12-40MM F2.8 PRO lens. This lens, by the way, is incredibly sharp and I highly recommend it for all Olympus and M43 shooters. Other equipment used was a Vanguard tripod and Olympus shutter release. Technically, I suppose you could say I also used the Olympus OI.Share app on the iPhone that I use to track and tag GPS coordinates onto my photos at the end of a day that involves a lot of moving around. While I didn’t specifically set out with this shot in mind since it was my first visit to Second Beach it just sort of materialized as the conditions allowed. I saw the sun setting and figured that making the sea stack a silhouette would be very dramatic, especially with the oranges from the sun setting. The biggest thing I did was try and move around a little bit to make sure I got the sun setting behind the clouds right in between the “U” in the sea stack. The light rays were just a bonus! Yes, there were some adjustments made in the shadows to darken the silhouette of the sea stack a bit, and of course in this type of shot I bumped up the luminosity to pull more orange out of the sunset and water. Typically I will also add some clarity to my photos to help crisp them up a bit. I switched to the Olympus M43 system around the time this was shot, and love that I can carry all the gear I own and the weight of the complete kit is less than my former Canon 7D and their 70-200/2.8L lens! My backpack typically has the Olympus OM-D EM-1 body, the 12-40mm F2.8 PRO lens that was used here, the Olympus M.ZUIKO ED 7-14MM F2.8 PRO lens, and assorted polarizing filters, lens cloths, small flashlight and usually a snack and water (sometimes you have to wait a long time for a shot!). Depending on the location, I may also have the Olympus 60mm Macro lens, and for a nice single walk-around choice the Olympus M.ZUIKO ED 14-150MM F4.0-5.6 lens. Remember, the M43 system has a 2X crop factor on the sensor, so that is equivalent to a 28-300 which is wonderful if you just want to travel very light and still have a ton of versatility. When shooting landscapes, and especially around Olympic National Park, conditions can – and do – change rapidly. Things may look poor with rain or heavy fog, but just hang in there and wait it out. You may be surprised that weather blows through and conditions turn from rotten to perfect! And if not, you still get to enjoy a day outside and an amazing view! One final tip is to know where the sun will rise and set, and the arc throughout the day. Many phones now come with a compass built right in, so it’s quite simple to figure out east and west, even for those of us who are directionally challenged!